During the summer months, Colgate students are fanning out across the globe to apply their liberal arts know-how in a variety of real-world settings, and they are keeping our community posted on their progress. 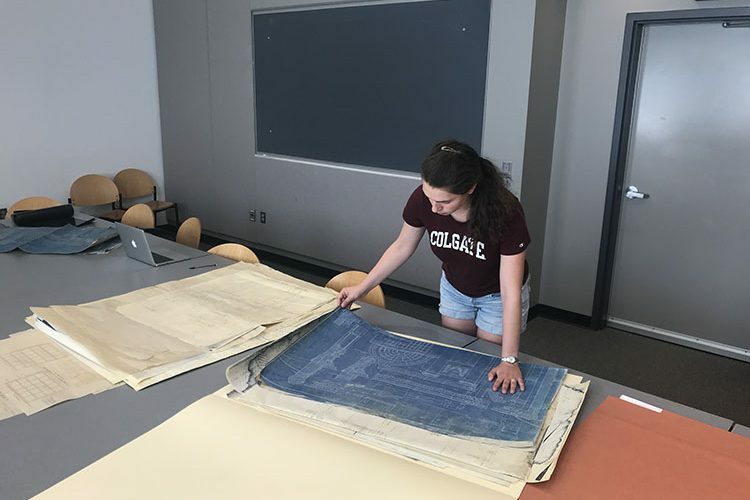 Physics major Ally Shahidi ’19 (Madison, N.J.) describes her work in making important historical documents digitally accessible. This summer, I am creating a database of Colgate’s architectural plans and researching the university’s architecture with Professor of Art and Art History Robert McVaugh. Our goal is to generate a comprehensive, detailed, and descriptive record of university documents as well as make them accessible to others. Colgate is fortunate to have records dating back to the 19th century for the development of the campus. These documents include architectural diagrams such as plans, sections, and elevations in addition to drawings, maps, and letters. After our research project is complete, these documents, currently housed in the architecture archives, will be cataloged in an online database that will be available through the university archives. It is easy to think of Colgate’s campus today as the only one that was ever possible, and these documents are therefore important as a record of the evolution of our built environment. In spring 2018, I took Professor McVaugh’s American Campus Architecture class, which addressed the architecture of Colgate’s campus across time in relation to the development of campuses across the country. The course allowed me to gain a deep understanding of the development of our campus. With Professor McVaugh and Emily Crichlow ’18, I also worked on the exhibition The Hill Envisioned, which examined campus planning over the course of Colgate’s history. Both the course and exhibition afforded me the opportunity to become familiar with many of the university’s architectural documents with which I am now working. My day-to-day role involves hands on work with the documents, recording data about each object and determining what information will be most valuable when included in the database. My challenge is to make a database that is useful for the wide range of people who will access it, from researchers to the university’s facilities department to students completing research assignments. I am developing many capabilities — including research, communication, and archival skills — that I will take with me following the conclusion of this project. Working alongside Professor McVaugh has afforded me the opportunity to learn from his extensive and detailed knowledge of architecture in general and the history of Colgate in particular. I have also learned a great deal from the documents themselves. Studying the work of a wide range of architects has familiarized me with each of their design processes and communication techniques. All of this is knowledge that I will bring with me as I look to pursue a career in architecture.